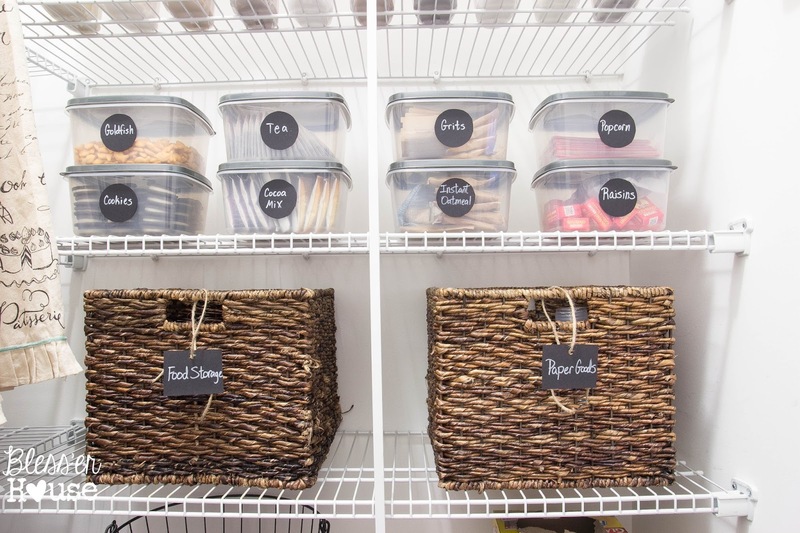 Tips for organizing a pantry using dollar store containers, recycled boxes, and repurposed baskets and bins, plus a free pantry inventory checklist to make grocery shopping easier. Cheers to accomplishing New Year’s resolutions in the first week of January! Huzzah! We won’t harp on the fact that the rest of my house is an utter trainwreck right now. But, hey, the pantry is organized, so the rest of this place doesn’t even matter. I thought this would be a fast process, and I would have this thing done by last night. Ha! I wish. But our pantry is finally in order, and I gotta say, I love how cheap it was almost as much as I love the final look. Whatever you do, do not spend $500 on food storage containers because I found three much cheaper options. Okay, y’all, can we stop for a second and appreciate how far this space has come? Excuse me while I cringe in shame. It physically pains me that I’m even showing you these before shots right now. Having a toddler who explores all of the shelves in her reach, being on-the-go most days, and having those obnoxious builder grade wire shelves that make every box of food fall over was a disastrous combination. I couldn’t even think anymore. And I’ve noticed that my mood changes along with the clutter in our house. If we have hit a disorganized state, I’m stressed out to the max. So I emptied that entire pantry, and said goodbye to my countertops for the day. My entire kitchen was covered in food containers. I honestly had wanted to organize our pantry for a long time, but the price of my “vision” was pretty steep. After doing my homework and finding that even the cheapest pantry storage options in Walmart were at least $5 per container, I resolved to finding something more budget-friendly. 1. Wrap cardboard boxes in pretty paper or fabric with labels. I collected diaper boxes for a few months with this plan in mind, and they work perfectly! The only cost was the $8 roll of paper I used. 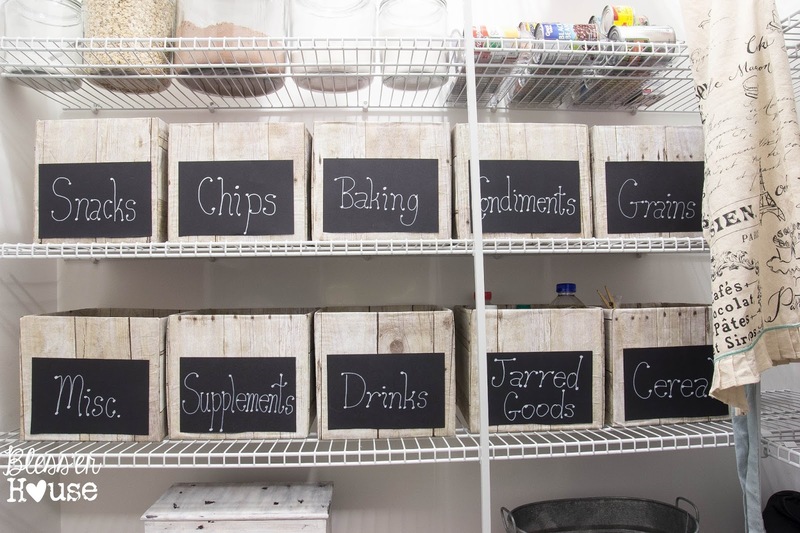 You can see my DIY pantry crates from yesterday’s post. They look pretty snazzy for only $8 for 10 big pantry boxes. I bought 8 tubs and 10 containers with pourable spouts. I cut out labels with black cardstock I had lying around, labeled them with a white chalk marker, and taped them on. I could have gotten fancy with printed labels, but I kept it simple. I’m not totally sure these are air tight, but they are doing awesome so far. And they’re much more air tight than the store containers all of the food was in before anyway. 3. Shop your home for baskets and bins. I sort of have a basket addiction. They come in handy a lot around our house, so when I needed a little more food storage, I put a couple of baskets from our living room to good use. They were only holding clutter anyway, which forced me to organize that little bit too. Win win! While searching our house for other baskets, I found a couple of wire ones to hold my cook books and Lola’s pet supplies too. And I repurposed a galvanized bucket sitting on a bookshelf that served a better purpose as a potato bin. I keep walking by the pantry and find myself just staring at it in awe. How many people can say that, right? Actually, don’t answer that. I’m probably just weird. 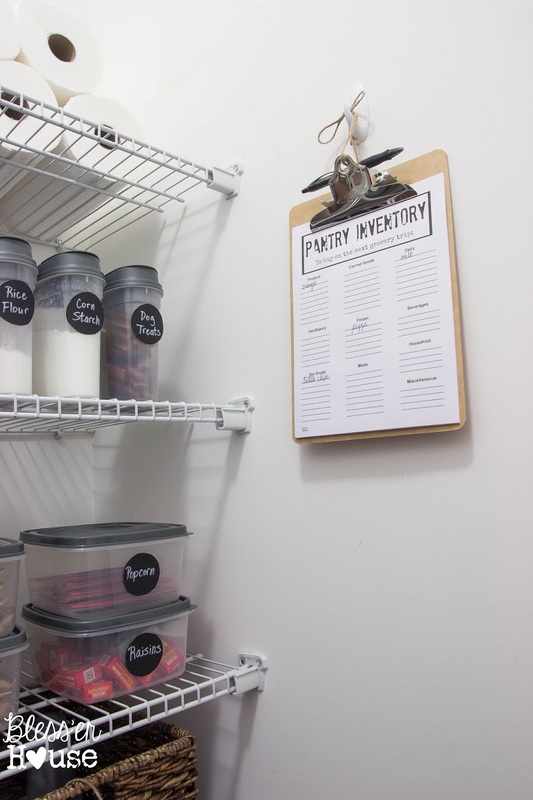 I happened to already have those glass containers from earlier last year when I first attempted the pantry organization process and sort of lost my steam. They’re great in here too though. I bought them at Walmart last summer. I resolved to create a pantry inventory list to hang on the wall in here too. I usually have a running list in my head of things I need to buy when we run out, but I never fail to forget at least one item every week. I’m hoping this solves that dilemma. And maybe I won’t have to spend as much time writing out my grocery shopping list each week. Update: 8 months later, it is STILL mostly this organized! I’m probably as amazed as anyone. If you liked this organizing post, you can see more of my budget organization ideas here. Wow, what a makeover! Who would have thought cheap storage containers and diaper boxes could look so good? You are really making me wish I had a pantry right now 🙂 Love it! I absolutely love this! You’re so right about storage containers being so expensive. These are some amazing solutions. Amazing! 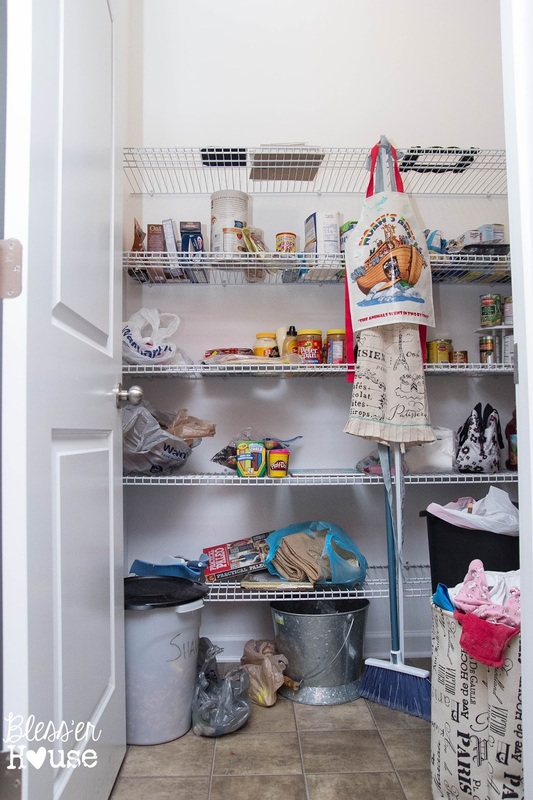 I am so jealous I don’t have a pantry to clutter up then declutter! So much gratification. You did a great job!! Thanks for sharing at Think & Make Thursday! I’m positive it’ll get cluttered again but I can wish. Haha Thanks for the love! Looks Great!! I have an idea for my diaper boxes, but may have to snag some from that project to use in our pantry! I’d walk by and stare in awe, too. Good work! Love this! Great ideas and a gorgeous printable! 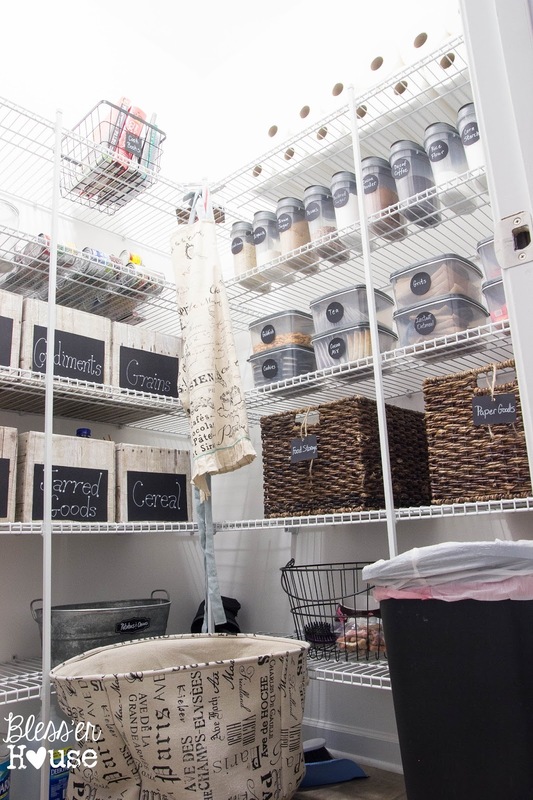 Love, love, love your organized pantry!! Makes me wish I had a pantry….. We are military – maybe in the next house! I love the look you achieved, especially with the diaper boxes and by “shopping your house”. Great ideas – thanks for sharing! I went to battle for our floor plan just so I could have this pantry. Hope you get lucky one day to have one too. And thank you so much for your service and sacrifice! Wow! Thanks so much for the dollar store tips. Next time I am near one (we live in the middle of no where-ville) I am going to look for those. I really need to organize my pantry but the cost for the containers was overwhelming. 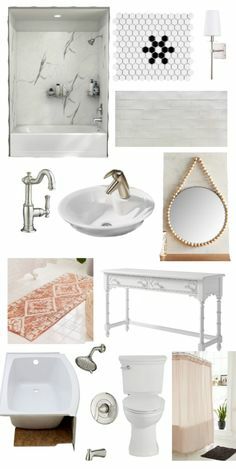 I am pinning so I can remember! Haha Definitely snag some when you venture to non-nowhereville. 🙂 I am always amazed at the dollar store. Thanks for the pin! 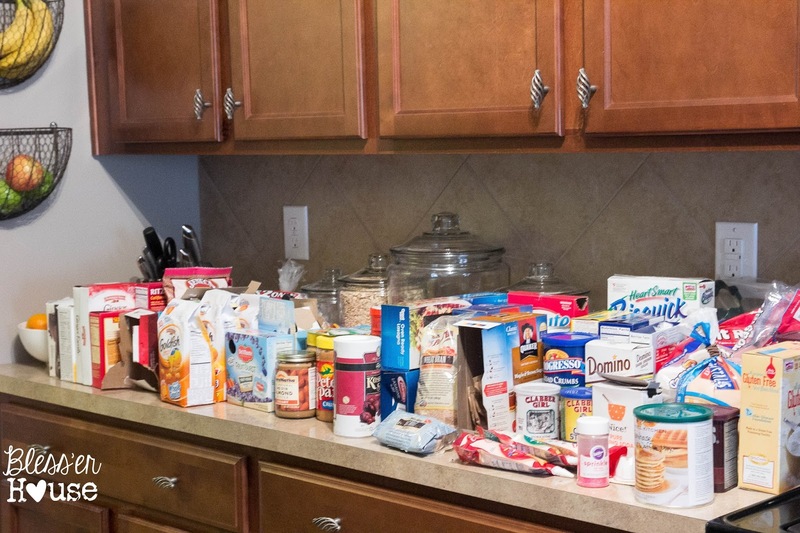 I just love cleaning out my pantry every few months… but, oh… what I’d do for a pantry that size!!!! I went to bat for our floor plan just so I could have this pantry. 🙂 It was worth it. Thanks Angela! I always forget about the dollar store but when I do go, I find the coolest stuff. Can’t imagine why I don’t go more often. Wow Lauren, your pantry is amazing! It’s so organized and pretty. Happy to feature your pantry and DIY crates at our party this morning. Always happy to have you share with us! 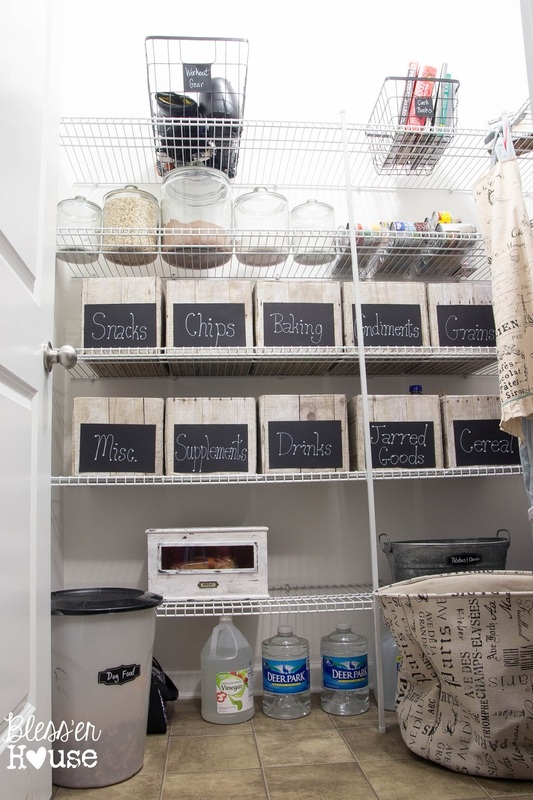 Oh how I wish I had a pantry to do this too! I’ve always loved the idea of covering cardboard boxes with fabric or pretty paper! Your pantry is so pretty and organized!! Pinned! So awesome how inexpensivley you redid that pantry! It looks great too! Sharing on FB! Thanks for linking it up at Monday Funday! Those diaper boxes are genius! Such a gorgeous pantry! Absolutely BRILLIANT! I’ve definitely got some major pantry envy! 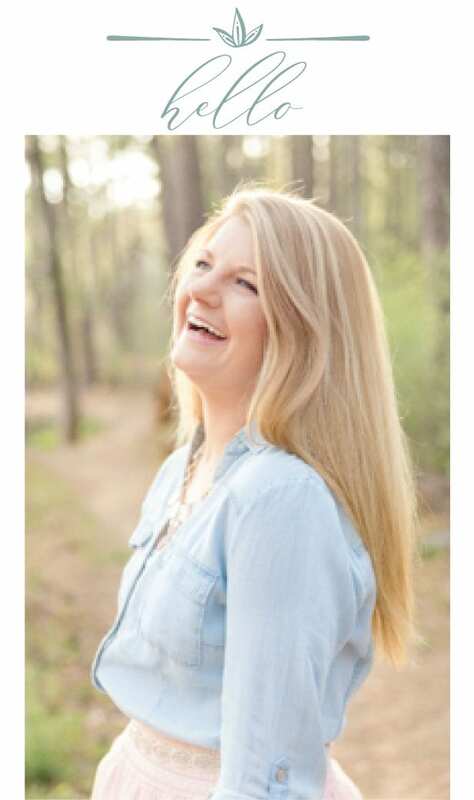 Thank you SO much for sharing at the Frugal Crafty Home Blog Hop Lauren! Happy Friday girl! You’re so sweet, Kristi! Thanks! Collecting boxes as mine are no longer in diapers… Where can I find the wood-look paper? I absolutely love what you did! My mama was the queen of projects that hardly cost anything, yet looked fantastic. She used to do something similar with large boxes. I was always amazed at what she could do with limited funds. Your pantry looks fantastic!! I have searched Wal Mart site for the can dispenser. Do you have a brand name? Ah darn! I don’t. I ripped the label off when I put them in the pantry. They’re the clear plastic soda can dispensers where the food storage containers are. Looks totally amazing Lauren!! I think you might have just motivated me to get started on our pantry! Woohoo! Get on it girl! It made me feel 100% better. Ok, I’ve gotta find some diaper boxes for those pantry boxes! So nice! Also, is it possible to fall in love with a pantry? Because I believe I just did! Love it!!! 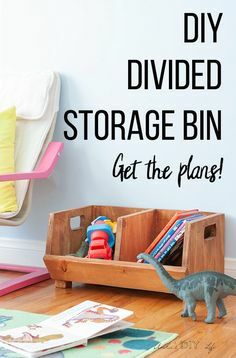 I can’t believe those are diaper boxes haha, they look totally amazing 🙂 What a fab way to repurpose your stuffs 🙂 Huzzah! Lauren the pantry looks fantastic. I can’t believe you did it with under $50. The crate paper looks great. We don’t have the dollar tree in Australia as you do in the US so it all costs at least 3 times as much for us at some of the discount stores, but I will definitely shop the house and see what I can use too. Lauren, this looks amazing! 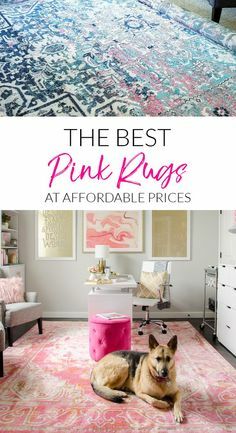 And I can relate to trying to organize on a budget with a young toddler in mind! Love the inventory list and I’m going to be using that! Finally someone who gets it! Is there a way you can take a close-up of the pourable jars and containers you got from Wal-Mart and Dollar Tree? I’m never so lucky! Thank you! Thanks, Rosemary! I’ll try to get a better shot of them to post. Here’s the link to the Walmart containers though. This is the gallon sized one: http://www.walmart.com/ip/Anchor-Hocking-Heritage-Hill-1-Gal-Jar-with-Lid/16486706 I use it for storing our protein powder instead of those giant plastic containers. There are smaller sizes of that jar too. I really appreciate your ideas! Keep them coming! Great ideas! I started saving glass jars a few years ago, especially one size that hold about 1 quart. I was buying a lot of peaches in that jar during that time. Those jars were just perfect for holding various nuts! So I labeled them “walnuts”, “almonds”, “pecans”, “sunflower seeds”, etc. The glass keeps them dry and handy. Then I discovered that they fit perfectly on a round turntable that I got at Walmart. We just spin that turntable, pick up the jar we want and return it to its spot. To clean, I usually just wipe off the outside and lid where our hands touch them. This is much easier than searching through plastic bags. Glass mayonnaise jars work great for some food that I buy in bulk. I also have a turntable holding all my herbs and spices. It works for us! Those are smart ideas, Martha! We go through jelly jars like it’s our job (toddler addicted to PB&J over here). I might have to steal that one. 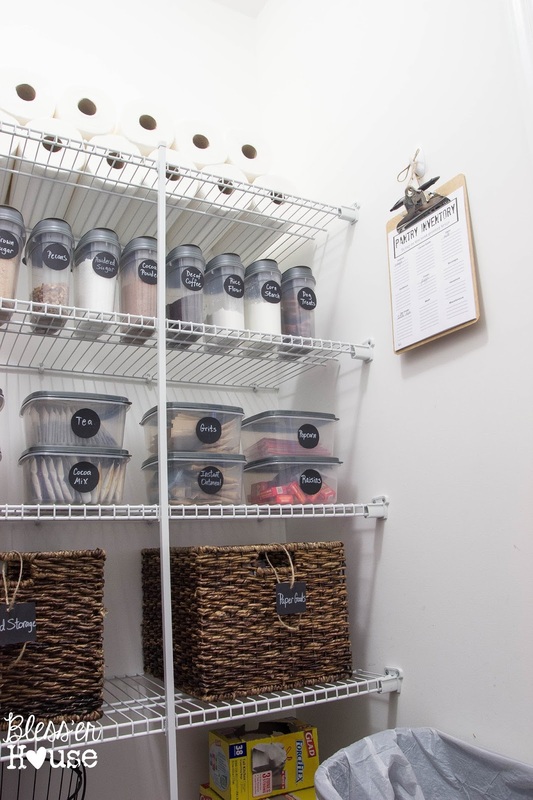 Gosh, I’d be happy if my pantry looked as good as your before! The diaper boxes are GENIUS, btw. I hate to raise a concern, but can’t not say it…the dollar store plastic bins would make me nervous. Who knows what chemicals off gas from plastic that is made with all the current USA safety standards, let alone something dirt cheap made in who knows what country with less standards than we have. And even if they are made here, our standards for chemical pollutants ain’t so hot, trust me. They do look SUPER cute, but if it were me I’d work on replacing them little by little w/glass ASAP. I do agree with Karen on the glass though. I repurpose all my glass jars for my pantry. They work great for stuff “out of the box” like Goldfish and my homemade taco seasoning and stuff like that. And, I guess they’re free, technically. Hi Lauren, you did an amazing and inspiring job! Where did you find your containers that you used for your cornstarch, rice flour, etc? I am looking for some those sizes but only finding expensive options. Please guide if you are able! Happy New Year! Hi Lindsay! So sorry for my delay! I got mine at the Dollar Tree, but by now, they might not be there anymore. I’ve had a hard time finding cheap ones with pourable spouts like that too. Maybe Ikea? I love the boxes… totally thought they were real wood crates at first. 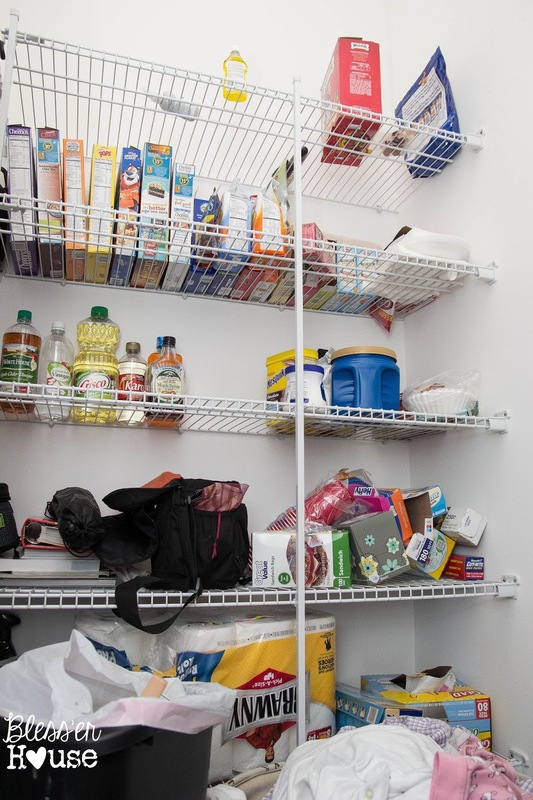 I was looking at my laundry room closet-turned-pantry and noticed the shelves are the perfect size for the small Home Depot moving boxes so I think I may try this (I have a 23 and 14 year old… way past diaper stages). It will make it look a lot neater at least. I have to have really good quality food containers because pantry moths are a huge problem where we live. I had to toss 2 trash bags full of food because they got into some cheap plastic food containers… was not happy! I would agree with the above comment on the dollar store containers though. A lot of their stuff has BPA which is a known carcinogen. For the prepackaged stuff like raisins in boxes though they should be fine. You just don’t want those chemicals leaching into your food. I love the simple chalkboard labels. It’s amazing how those little details can make everything look so much nicer. By the way, I am in love with your house! I bookmarked your page for inspiration. We bought a 20 year old track home and it’s still all builder grade everything… blah boring! Keep on posting.. love your blog! I’m so glad it helped! I think moving boxes would definitely work! I do want to upgrade to glass containers really soon but I also found that Ikea pantry containers are almost as cheap as these (I actually linked them in this post) and they are BPA free. I need to do a switcheroo of them for sure. Thank you so much for all of the love, Rachael! I have a Pantry cupboard, the shelves are so deep I was considering getting Roll Out shelves as reaching 22 inches to get something from the back is just too much. 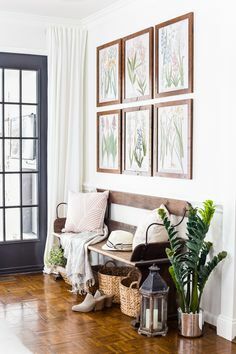 The 31 inch width can be expanded to 39 inches & this article made me realize I could remove it all, put shelving along the side & end & have a really grand walk in Pantry. Not sure if I would even put a door on it – well maybe one. I am really excited as I have been trying to figure out the most reasonable & suitable for my needs. That’s so great!!! So glad it could help! As much as I dislike our wire shelving, it is nice to have everything in easy reach. For those of you with the builder grade shelving with slats: Some “big box” hardware stores carry plexi glass pre-cut to the shelf size. Adding that will prevent items from falling through. Lauren – I loved your idea of covering sturdy boxes for a cohesive look. That’s a good idea! Thanks! I just love your pantry so I went to purchase the containers that you keep you brown sugar in but the sugar has hardened and my hubby was disappointed. I went on Pinterest to find out how to soften the sugar for quick use. How do you keep yours from hardening? Oh no! They are super inexpensive, so maybe I just got lucky with mine and they don’t let as much air in. You can put a couple of giant marshmallows in with your brown sugar to keep it from hardening. I forgot where I learned that handy little trick. IKEA has containers that are really cheap too though, and I believe theirs are airtight. I linked them alongside the containers I used if that helps. Thanks, Crystal! I know what you mean. We upgraded to this floorplan mostly because of the extra storage space. Although, I’m convinced now that the more storage space I have, the more clutter I accumulate. 😉 The organizing of it does help a lot with the space issue. What an awesome looking pantry! Who knew that part of the kitchen could be that organized?! Looking forward to trying that sometime soon! Thank you, Andrea! It was driving me batty. It’s not quite as organized now, but still so much better than it used to be. Wow! Love, love your pantry! I could stare at it forever – it makes me feel happy and peaceful. You did an amazing job. Truly inspiring! 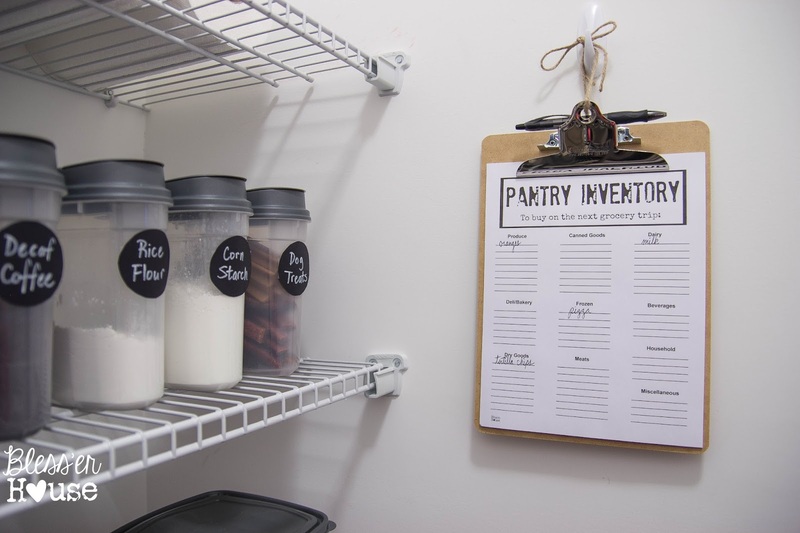 I have tried several times to print the Pantry Checklist, and have had no luck. It keeps having me resign up with my email address and still I have not gotten and email for the printable Pantry List. Can you please help or tell me what i am doing wrong. Thank you! another fondness ive found?? the dollar store for the foldable “cloth” bins.. yes.. target has better and more colorful ones.. but i kinda cringe when i look at the price and start calculating just how many id need..
Omg, I just wrote the most beautiful, glowing comment, then lost it when I tried to post. (Apparently the internet dropped me while I was typing). Here are the cliff notes: I love your blog. It’s the first one I’ve ever looked at. Really! I’m hooked! I’ve been sitting here (for too long!) meandering through your posts and pictures just loving all the ideas you write about. 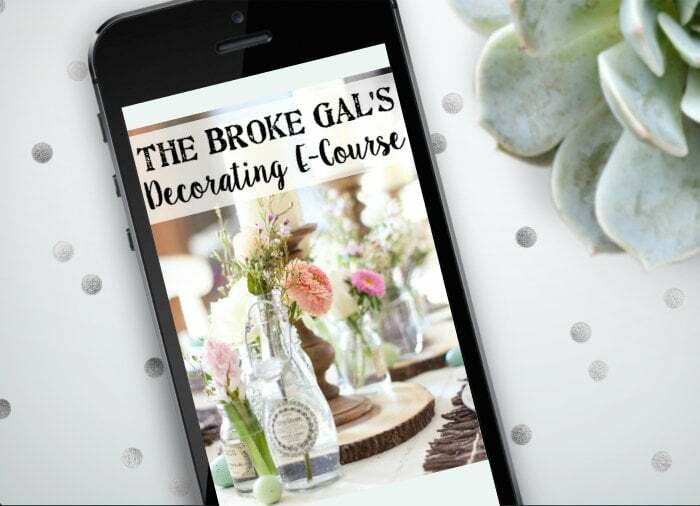 The links you provide work so smoothly…I even love the color you use to highlight them! 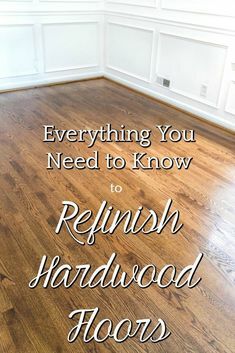 I appreciate all the info you give us, down to where I can get supplies and items that you’ve used in your decorating. (And organizing). Thanks, too for sharing so freely your family and your faith. I will definitely be stopping by often!